The soundproofing of commercial, condominium and apartment buildings is a huge stake for the owners and the renters. The builders are constantly looking for ways of reducing or eliminating impact noises and airborne noises in their structure. There is a unique and innovative solution on the market that ensures soundproofing of drywall ceilings. It exceeds all acoustic requirements of the industry. The ACOUSTIVIBE, produced by Soprema, is a ceiling acoustic anchoring system. The insulators and the ceiling furrings allow the decoupling of the ceiling structure with the gypsum. The mechanical system being equipped with a rubber insert, it absorbs the impact noises and the vibration on the floor above and avoids the vibration noises in the ceiling. The ACOUSTIVIBE system allows the gain of 2 to 7 points (AIIC) in comparison to a conventional resilient bar system. The ACOUSTIVIBE insulators allow the ceiling furrings to be suspended instead of directly fixed on the wood beams or joists. They require parallel installation on the sides of wood beams or joists. The distance between each anchorage varies depending on the installation mass. 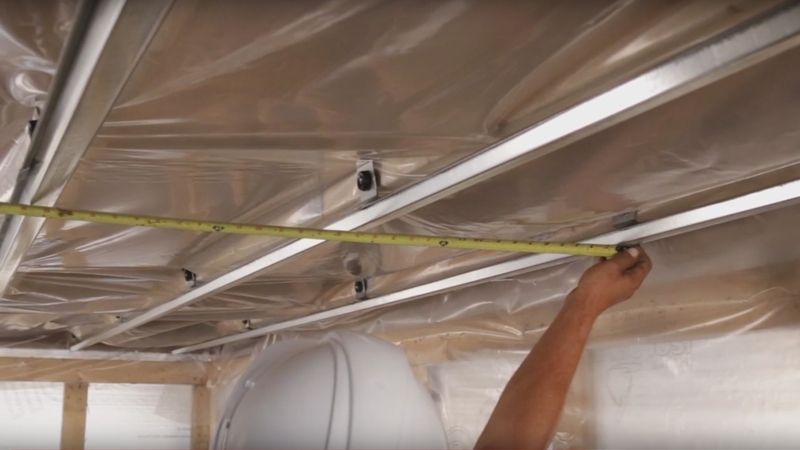 It is necessary to install an insulator every three linear feet when the installation is a single layer drywall system and every two linear feet for a double layer drywall system. For mechanical reasons, it is important to choose the ACOUSTIVIBE furrings specially designed for the ACOUSTIVIBE anchorage system (the regular furrings are unsuitable for this type of installation). Because the ACOUSTIVIBE insulators have to be fixed on the beam’s side, it is preferable to use a mat insulation instead of blown insulation. If a blown insulation is used, a polyethylene film has to be installed to hold it back. In that case, it is important to install the polyethylene first, followed by the insulators and then the blown insulation. The CDC and WDC ACOUSTIVIBE insulators are different from the traditional one because they are designed to be installed on structures that are not made of wood beams or joists. However, we confer them the same properties. The CDC insulator is designed for the concrete slab structures, the steel and concrete structures or for any structures that is not made of wood with concrete from which the ceiling is suspended. The WDC insulator is designed for the solid wood structures such as cross-laminated timber (CLT) from which the ceiling is suspended. Moreover, it can be used on beams or joists when a soundproofing tiles suspended ceiling is used. Canada and United States patented products. If having a superior soundproofing for your buildings is a priority for you and you’d like to learn more on the ACOUSTIVIBE anchorage system, watch this short video. Contact us, we’ll be pleased to analyse your plans and advise you on the acoustic solutions that best suit your needs. Finally, this ceiling acoustic solution combined with high quality flooring membrane will ensure you a high acoustic performance that will go beyond the requirements. Whether it is for glued down, floated, ceramic or vinyl flooring, AcoustiTECH offers a wide range of high quality acoustic solutions.